I was reading Alasdair Campbell’s paper, ‘West Highland heraldry and the Lordship of the Isles’, in Richard Oram’s The Lordship of the Isles (vol. 68 of The Northern World, 2014) (there is a similar paper online at The Heraldry Society of Scotland). Campbell discusses the repeated, formulaic usage of a limited number of charges on the arms of various Highland and Island family heads; he suggests that the Lion indicates Dalriadan royal descent; the Galley Norwegian royal descent through Somerled; the hand Ulster royal descent via the O’Neills or Columba; but he does not really have a plausible suggestion for the significance of the salmon. The Queen Mary harp has four roundels on the pillar. 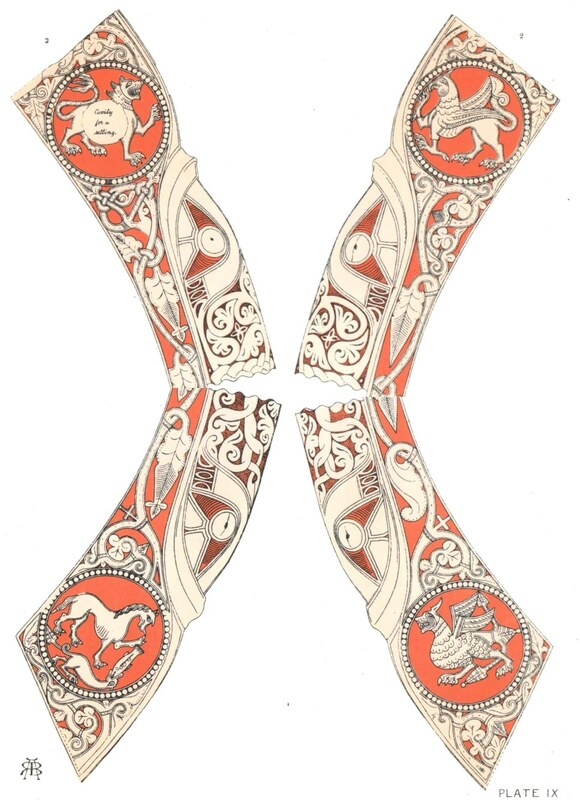 Top right is a lion passant; top left is a griffin passant. 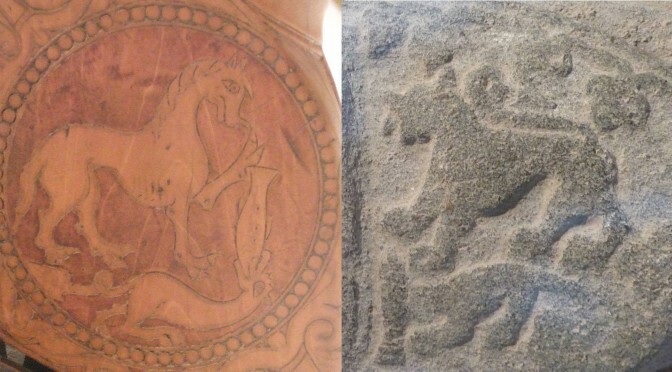 Bottom left is a wyvern, and bottom right is the strange scene where a unicorn holds the tail of a fish, while a two-legged serpent bites the fish’s head. Sanger & Kinnaird connect the lion to medieval symbols of Christ, as the lion is connected to reincarnation, and they suggest the griffin is a symbol of Christ in majesty. But I wonder if the lion might be connected to the heraldic lions seen on West Highland blazons. I think the lion on the shields is usually rampant whereas the lion on the harp (and on many of the carved grave slabs) is passant. 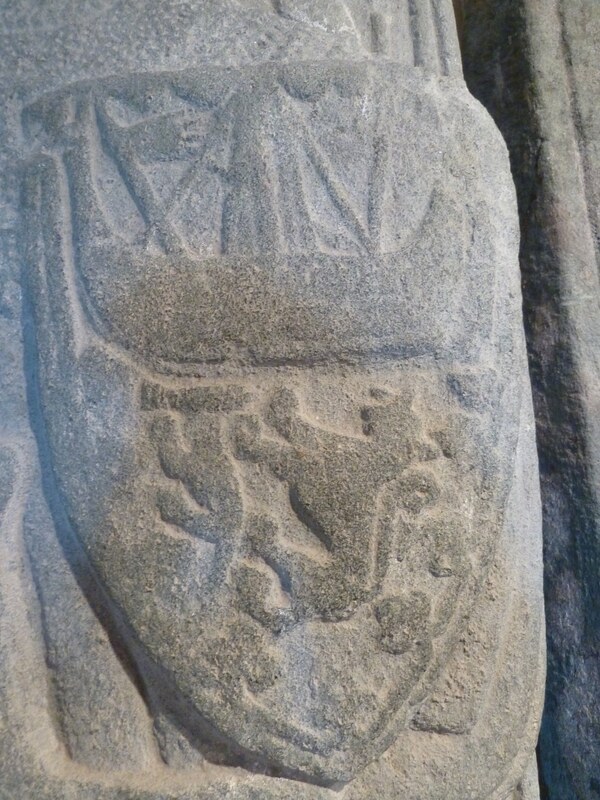 A wyvern does appear on one late medieval West Highland shield, on the effigy in Iona (RCAHM 209 / Abbey Museum 100, from Reilig Odhráin) but I don’t know whose effigy or blazon this may be – I don’t know of any wyverns appearing in later heraldry in this area. I would say that the style of the wyvern on this shield is rather different from the wyvern on the Queen Mary harp. The most intruiging roundel on the harp is the bottom right one, showing the unicorn, fish and serpent. I have suggested before that the serpent is a lindworm, as it has no wings and just two legs. I noticed some time ago that the shield of the effigy of Gillebride MacKinnon (Iona) has a scene that may be a version or variant of this. Gillebride’s shield has a galley in chief, but underneath that is a scene that has confused some commentators. Steer & Bannerman largely ignore the shields of the effigies, dismissing them as a “heraldic toy”, and they identify two of the animals as “an otter pursuing a salmon” (p.187). However I think we should give serious consideration to the question of whether Gillebride’s shield is carrying the same motif as the Queen Mary harp forepillar. Right: detail of the effigy of Gillebrìde MacKinnon, Iona (Photo: Karen Loomis, used with permission). Left:detail of the Queen Mary harp. Looking at the similarities: we have two beasts, one above the other, facing in the same direction; the upper one larger, showing four legs, with wide, perhaps cloven feet; three projections from the head (perhaps 2 ears and a horn? ); the lower beast smaller, with two legs shown, and a long thin tail. Between the mouth of the lower beast and the feet of the upper is a fish aligned vertically. However there are differences. The orientation might be explained by them being on the right side of the pillar of the harp, and so being flipped to face forwards. The upper beast on the stone has a lions tail, but I understand this is a common attribute of unicorns in medieval art. The lower beast on the stone is shown with two legs but they look more like a forelimb and a hindlimb, than a pair of hindlimbs as on the harp. And finally, the fish head points down on the harp, but up on the stone. It is also queer that the scene on the shield is oriented vertically. I suppose that many of the figures on the graveslabs run up and down the slab, but I would still have expected the animals on the shield to face left not upwards (though I note that the wyvern on the shield of Iona 209 also faces upwards). Detail of effigy of Gillebrìde MacKinnon, Iona 207. Photo: Karen Loomis, used with permission. Clachan no.9 (Argyll v1 p.110) Kintyre school, 15th century. I have not been able to locate a picture of this slab. The RCAHM catalogue entry says it is damaged and very worn, so perhaps it is too hard to photograph. It describes “…to the left a row of creatures (a griffin, an otter pursuing a salmon, a goose, a crab or frog, and a ?hare)”. I wonder if the griffin, or the “goose”, is interacting with the fish at all? St. Cathan’s Old Parish Church, Gigha no.4 (Argyll v1 p.112) Kintyre school, 15th century. There is an illustration of this slab in White, Knapdale, pl.iii.1 but I have not seen this yet. The catalogue describes “several animals including an otter pursuing a salmon”. Killean no.6 (Argyll v1 p.137 & pl.43b) Kintyre School, 15th century. 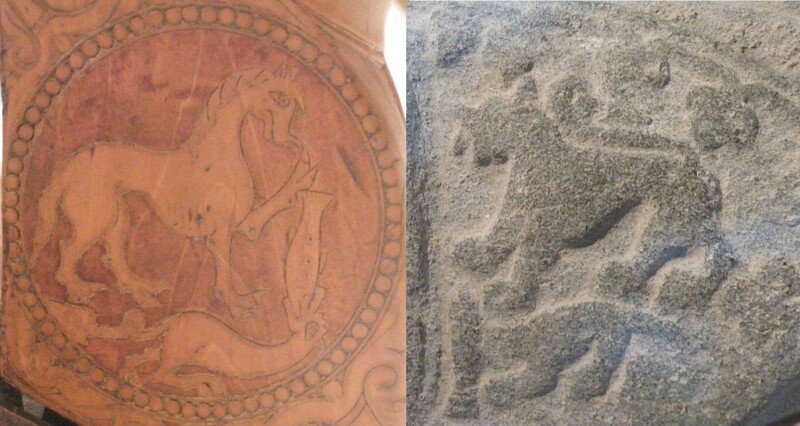 The catalogue describes an inscription for John Mac Euan, and “below the inscription there is an otter pursuing a salmon, a bird, a stag hunt…” The bird is behind the quadruped and not apparently interacting with the fish. Saddell no.11 (Argyll v1 p.144) Kintyre school, 15th century. There is an illustration of this slab in White, Kintyre, pl.xxiv.1 but I have not seen this yet. The catalogue says it is “in two pieces and very worn”. Keills no.12 (Argyll v7 p.88) Kintyre school, 15th century. There is an illustration of this slab in White, Knapdale, pl.40.1 but I have not seen this yet. The RCAHM catalogue describes “down the right edge, in descending order, two dogs, a ?heron, a salmon and otter”. Kilmory no.18 (Argyll v7 p.166) Kintyre school, 15th century. There is a photo of this slab in Steer & Bannerman pl.18b. The RCAHM catalogue describes “a bird pecking at a salmon which is pursued by an otter”. Kilmory no.35 (Argyll v7 p. & fig.) Iona or Kintyre school, 14th-15th century. An effigy of an armed man, with an inscription which is almost completely illegible. The man’s shield shows a galley, and possibly part of a flory lower border like on Gillebride MacKinnon’s. The catalogue says: “On the base-slab to the left of the body is carved an otter pursuing a salmon”. As you can see from my sketches, the depictions are very obscure and hard to make out. I don’t see how the standard identification of “an otter pursuing a salmon” can stand up – where did this identification come from in the first place? I wonder if Oronsay 11 is meant to show our scene, with the “hound” taking the fish’s tail – is this the unicorn? And is the strange thin “otter” beneath the fish, meant to be the serpent? You can almost imagine its two hind legs, tail and mouth. Is Kilmory 18 also meant to show this scene? It’s hard to say. I had been assuming that on these slabs, the animal usually identified as the “otter” is where we see the serpent on the Queen Mary harp, but now I am not so sure. I am keen to see Keills 12, to see what the “?heron” actually looks like. And of course at some point I should try to see these slabs in person. The little photographs are not that revealing! Good stereo images of the fishes and associated beasts would be very useful here.